High-speed 2 certainly looks cool. But that doesn’t mean it’s the best way to improve the rail network. Whenever a fellow academic hears that I’m studying British railway history, they almost invariably ask me my opinion on HS2. For those of you who are not familiar with British transport politics and related acronyms, HS2 stands for “High Speed 2”: A planned extension of high-speed railway track from London to Manchester and Leeds. (High Speed 1 refers to the only high-speed track that currently exists in the United Kingdom, linking London with the Chunnel). The plans are controversial, and in addition to the predictable NIMBYs, HS2 is opposed by a large coalition of environmentalists, public spending critics, and at least one one prominent railway journalist turned Mayoral candidate for London. I’m not going to try and critique the cost-benefit analyses offered by either side of the debate. I just don’t have the expertise (Though, as I argued in Manchester Policy Blogs, a cost-benefit analysis is not necessarily a useful approach when considering transport infrastructure that will last for decades). But there is an interesting discussion to be had about why, of all possible rail investment schemes, HS2 was chosen. I’m going to tackle that in this post. High speed rail gets a lot of attention all over the world because it’s fascinating. It’s big, fast and futuristic. That makes it a very tempting project for any government that can pony up the cash and weather the inevitable storm of objections. But a more sober assessment suggests that it might not actually be as revolutionary as is commonly suggested. Anybody with a web browser can confirm that the railways in Britain are already considerably faster than the roads. In fact, all you need is a web browser. Google maps suggests that the fastest route from, say, Edinburgh to London by car will get you there in just under 7 hours. If you then have a look at the same journey by rail, the average time is about five hours, with some trips taking as little as four and a half. So trains are already a good deal faster than cars. And yet, people still generally prefer to travel by car. HS2 will only affect two routes in England, and on a trip to Manchester-its furthest destination-it will decrease journey times by about an hour-about a 50% cut in the time it takes. That is certainly useful for business travellers from Manchester who want to make a morning meeting in London, but does it really make rail that much more attractive to driving, which currently takes three and a half hours without traffic? I think that maybe if we could bring people onto the rails by making them faster than cars, the existing lines would have already accomplished that. The problem is that even the fastest trains in the world don’t offer a solution to what transport scholars call the last mile problem. Before boarding a train, passengers must somehow get from their house to a station, and after arriving they will have to find a way from the station to their ultimate destination. These first and last legs of the journey can often be inconvenient, which is why a car, which completely eliminates the problem by providing door-to-door transportation, can be very attractive. In Britain, where many rural railways were gutted in the 1960s, the last mile is actually quite a bit longer than a mile. If you live in, say, Aberfeldy, then your nearest railway station is in Dunkeld, which is nearly 20 miles away. So the train is probably not much of an option to get from Aberfeldy to London, even if it is high-speed from Manchester onwards. What this suggests to me is that a good way to encourage more use of the rail network is not to increase its speed, as HS2 proposes to do, but increase its coverage. Even after significant cost overruns, the reopening of the 100 mile Waverly Line from Edinburgh to Carlisle cost £348 million. At that price of between £30 and £40 million per mile, you could reopen somewhere around 1000 miles of more conventional railtrack to connect to regional centers in Britain with the £43 million estimated cost of HS2 (Some . That would mean fewer people with no choice but to lose their cars if they want to travel more than a few miles. There is an element of social justice to this as well. Rural communities without easy access to a rail network can suffer from social isolation, especially as fuel costs go up. From their perspective, then, a £40 billion government expenditure on a fancy high-speed rail network to connect England’s largest cities would not seem like much of a boon when they don’t even have a neighbourhood station. If the aforementioned business travellers are the ones who benefit most, then such a project seems decidedly contemptuous of both rural-dwellers and the poor. But we’re not talking much about investment in local lines, are we? High speed rail is big, flashy, and exciting, and the modest two-car trains that I take into the peak district are not. In democracies, then, projects like HS2 will always have a political advantage over their smaller counterparts. That’s a problem. To solve it, maybe we should find a way to make regional transportation just as exciting as big and fast projects on the trunk routes. How? I don’t know. I’m not an engineer. But I do know that there are people out there who could come up with some neat ideas if they put their minds to it. We are on the verge of a transport future that involves self-driving cars, flying drones, and maybe even a hyperloop. Surely dreamers like Elon Musk can come up with something big and exciting to connect small villages to the transportation network, rather than merely speeding up travel between big cities which are already well-connected. Maybe it involves cheap comfortable, self-driving cabs. Maybe it involves laying some new light rail track through rural areas. Maybe it involves a new generation of buses designed to attract passengers who would normally shun bus travel. People like big, flashy projects, and that means that they get funding. Rather than resisting that tendency, transport planners and environmentalists should take advantage of it! I keep coming back to the hyperloop on this blog, despite it’s fantastical nature, because it is an excellent example of how technological visions work. The Hyperloop captured the public imagination by releasing a single sixty page paper. So a new concept for regional transportation wouldn’t even have to be technically or economically likely. It would simply have to get the public excited about the idea of improving the transport links to small towns and villages. That would empower more pragmatic thinkers to find plausible ways to solve the problem. This doesn’t only apply in the United Kingdom, by the way. High-speed rail is a popular policy option among environmentalists in Canada and the United States, but that ignores the massive success enjoyed by, for example GO Transit, the Toronto commuter rail operator, in recent years. Places with GO lines tend to use them. 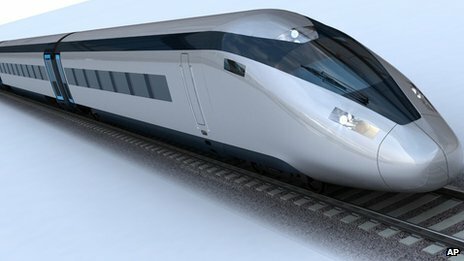 So is HS2 a good idea? I don’t know, although if it’s a choice between more rail infrastructure and more motorways, I’ll go with HS2 in a heartbeat. But maybe there are alternatives that would be more effective. And maybe we need to find a way to make those alternatives exciting. Somebody tell Elon Musk to get on it.